With the passing of Labor Day weekend, so too marked the end of summer vacation for area schoolchildren. HOULTON, Maine — With the passing of Labor Day weekend, so too marked the end of summer vacation for area schoolchildren. 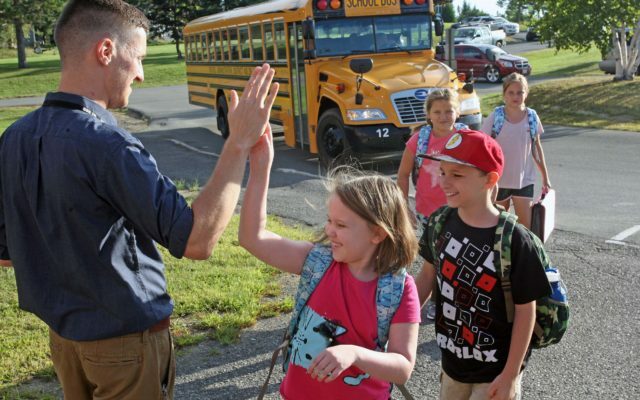 Students in kindergarten to sixth grade, as well as freshmen, returned to classes Tuesday morning in RSU 29 (Houlton, Littleton, Monticello, Hammond). Those youth in grades seven and eight, as well as sophomores, juniors and seniors had one more day to enjoy as their classes start Wednesday, Sept. 5. Many students at Houlton Southside School (grades 3-5) were eager to return to classes Tuesday morning. Ashtyn Colter of Littleton, a third-grader, said she was eagerly looking forward to the start of school. “I’m excited to see all my friends,” Colter said. Liam Wellington, a third-grader from Littleton, said he was “very” excited to go to a new school building. “I can’t wait for gym and science class,” he said. Houlton Police Chief Tim DeLuca reminds motorist to use extra caution as they head to work each morning. In SAD 70 (Hodgdon, Amity, Cary, Haynesville, Linneus, Ludlow and New Limerick) and SAD 14 (East Grand) students also returned to the classrooms Tuesday, while those at Southern Aroostook Community School (RSU 50) and Katahdin elementary and high school (RSU 89) returned to school on Wednesday, Aug. 29.